Thanks BC for putting this out as I'd been following it on your site. For those that have Axiom it's a free update. What's even better is you'll get an email (if you're on the list) for a severely discounted standalone version of ReGuitar - meaning you can use ReGuitar without having to run it inside Axiom. This is very interesting. What does one need to do to ensure the best success at morphing one tone into another? Or does the software flatten out whatever tone it is given and then the proper eq curve is applied afterwards? So we just download the latest version of Axiom and it'll be in there? 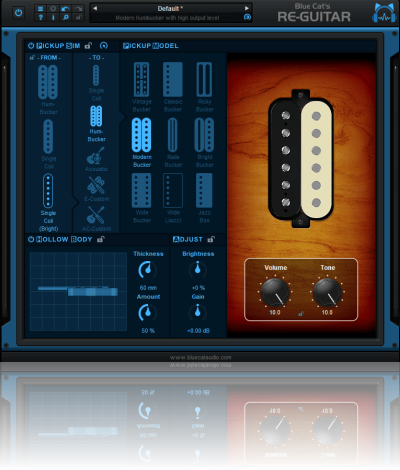 It'll be interesting to hear the official story, for what I can see the plug ask you to select with broad strokes the input device then gives you the tools to fine tune the results by ear, compared to what Revalver had (making you play chords so the plugin could create a "profile" of your guitar) this is a much better system. Yes, it's under the "Built-in FX" category and there are a couple of "Re-Guitaring" preset examples in Axiom. then gives you the tools to fine tune the results by ear, compared to what Revalver had (making you play chords so the plugin could create a "profile" of your guitar) this is a much better system. We have indeed tried a couple of things for calibration and found out that the stupid simple way was the easiest to use and the one that gave the best results. You would think at first that an exact calibration with complete measurement of the input guitar would work better, but it did not seem to be the case for us.